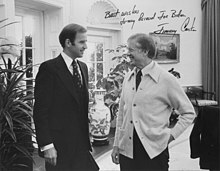 After completing his second term as vice president, Biden joined the faculty of the University of Pennsylvania, where he was named the Benjamin Franklin Professor of Presidential Practice. As of March 2019[update], Biden was reported to be actively considering a 2020 presidential run, after a mid-2018 Hill/HarrisX poll placed him at the top among potential Democratic presidential candidates. 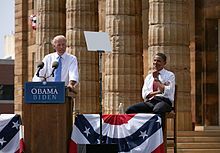 There have been multiple photographs of Biden engaged in what commentators considered to be inappropriate proximity to women and children, including kissing and or touching. 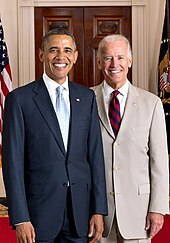 Biden has described himself as a "tactile politician" and admitted the behavior had got him in trouble in the past. ^ Manchester, Julia (July 27, 2018). "Biden, Sanders top poll of possible Democratic presidential hopefuls". TheHill. Retrieved October 18, 2018. ^ Smolenyak, Megan (April–May 2013). 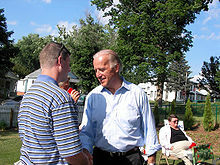 "Joey From Scranton – Vice President Biden's Irish Roots". Irish America. ^ a b Cook, Rhodes (1989). "The Nominating Process". In Nelson, Michael (ed.). The Elections of 1988. Congressional Quarterly. ISBN 0-87187-494-6. CS1 maint: Extra text: editors list (link) p. 46. ^ Heffernan, Virginia. "Joe Biden is sorry, not sorry". latimes.com. Retrieved 2019-04-07. ^ Lerer, Lisa (2019-04-05). "Joe Biden Jokes About Hugging in a Speech, Then Offers a Mixed Apology". The New York Times. ISSN 0362-4331. Retrieved 2019-04-08. ^ Kiely, Kathy (September 12, 2005). "Judging Judge Roberts: A look at the Judiciary Committee". USA Today. Retrieved August 24, 2008. [dead link] See also: "2008 U.S. Senate Votes". American Conservative Union. Archived from the original on March 30, 2009. Retrieved March 20, 2009. Lifetime rating is given.